Recently when I had put my fancy pants blogger hat on and had a little in depth look at my stats and all that jazz I noticed that my most viewed post of all time is in fact a Lush review, namely my review of their Movis Facial Soap. I do have to say that it was a sight which made me incredibly happy as that particular post does hold a high place in my list of favourite reviews I've published. 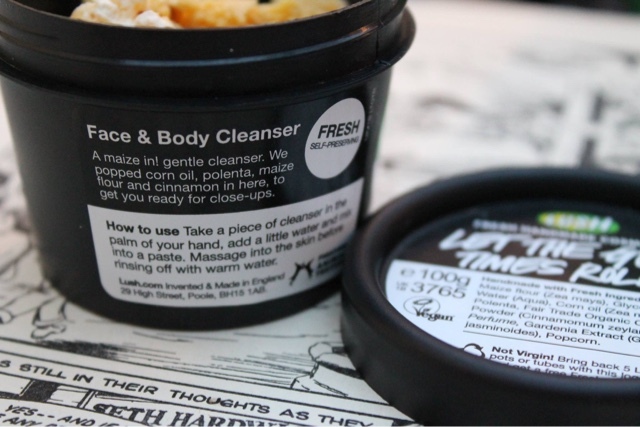 Something I believe is crucial to blogging is providing content that your audience will adore so if posts about the latest bit of magic the lovely people at Lush have created is something that floats your boat, I'm more than happy to oblige. And you know me, I'm not one to pass up an opportunity to purchase even more Lush products with the excuse of it being for a blog post, am I? Today I thought I'd continue with the theme of Lush and their skincare beauties by sharing with you a product that I simply adore but think its really overlooked by the vast majority of Lush shoppers. 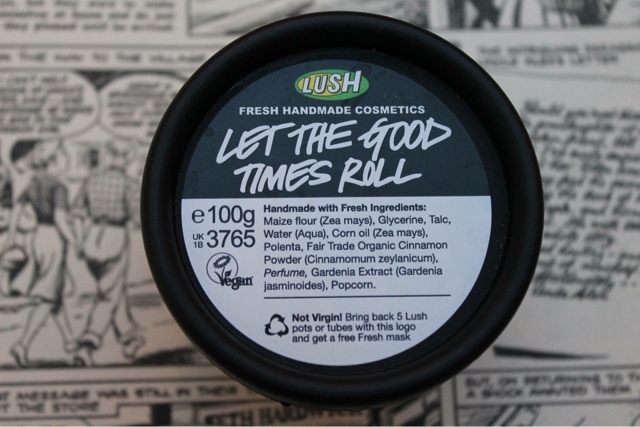 I'm talking about the Let The Good Times Roll Face and Body Cleanser. I've been using this particular product for a fair while now and it's definitely become a real staple in my skincare routine. As with everything from the golden people at Lush, this cleanser is honestly such a pleasure to use and I truly believe my skin would not be the same without it. 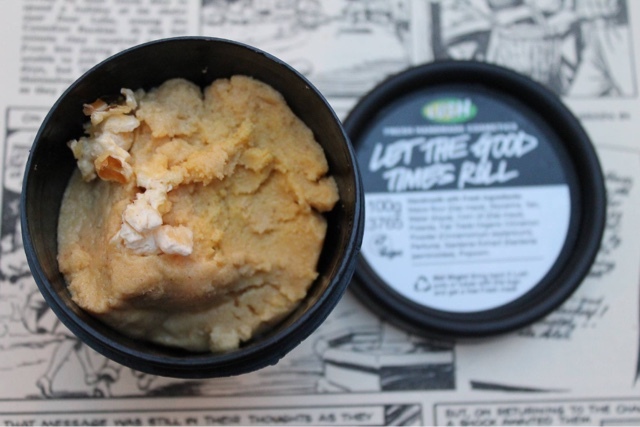 I use Let The Good Times Roll after removing my makeup (with the Lush Movis face soap of course) and apply it by popping a small piece in my the centre of my palm and adding a dash or two of water until a grainy paste-like consistency is created. From there I simply massage it all over my face and neck, taking my time of course to allow my skin a proper pamper, and remove using a warm damp flannel. One of the definite contributing factors to this product taking its place as one of my holy grail skincare products is how caring it is to the skin. Don't get me wrong, this cleanser exfoliates like it's nobody's business but it's so gentle on the skin and leaves it feeling soft and nourished as opposed to stripped of its goodness. I don't know how the team of lush have invented a product that can commit such sorcery but I'm definitely not complaining. For this reason I'm able to use this product on my skin each and every day however I would recommend refraining from doing so if you have more sensitive skin as your skin may not enjoy the tough love that your skin experiences. The one negative element of this product I've discovered is it's quite a tricky task to remove all of the cleanser from your skin as a result of the rather gritty nature of the product once the paste has been created. The vast majority of the cleanser can be removed with the use of a flannel but I do find myself feeling the need to splash my face with water a handful of times following the removal just to remove any excess. I've also found that a good swipe of toner can also remove any stray extras, leaving you with a completely clean face. 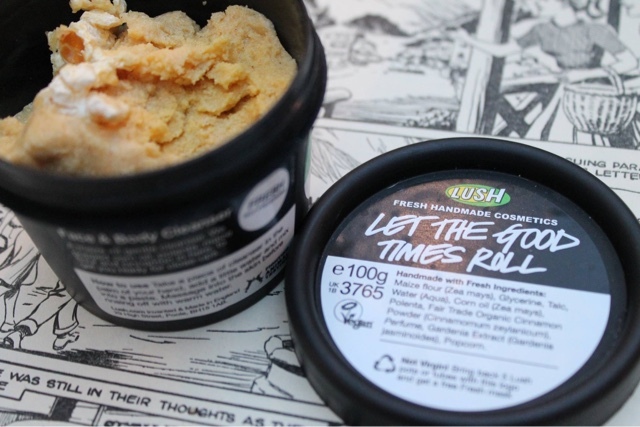 Let The Good Times Roll features a scent reminiscent of a good cinema snack; a sweet addictive buttery caramel-like smell that is honestly good enough to eat (but remember this is a treat for your skin, not your stomach). I'd also like to take a moment to mention the extra little treat Lush provide you with in the form of tiny pieces of popcorn that lurk within the dough-like product to add an extra little bit of magic to the cleanser. Something my student bank-balance definitely values about this product is the fact that a little truly does go a long way so a single pot can last a fair while. For this reason I always purchase the 100g pot however Lush does also stock a ginormous 250g pot if you're one of those go big or go home types. 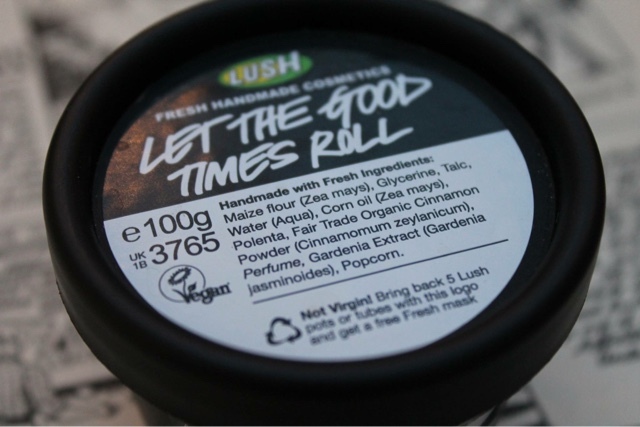 Let The Good Times Roll retails at £6.95 for a 100g pot and is available in Lush stores and online here. I'd love to try some 'Lush' products but Guernsey doesn't have a store and I'm not a fan or ordering this sort of product online in case the company won't give refunds on opened products... My next trip to the UK will consist of a visit into a Lush store!